Sign Language Interactions are delighted to be the VRI providers for Greater Glasgow & Clyde NHS – with VRI available throughout a number of sites across the GG&C NHS estate. The online service means that staff can quickly link up to an interpreter at any time – 24 hours a day, 7 days a week – and communicate with their patient. It can also be used during hospital stays, when an interpreter is not always present. Patients can use the service to communicate with staff and with family members at home, helping to reduce the feeling of isolation. If you would like to access the online service contact the Support & Information Service on 452 2387. 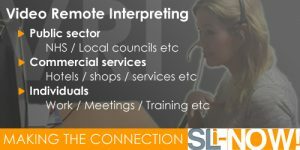 More information on our VRI services at our dedicated website: SLi-NOW!